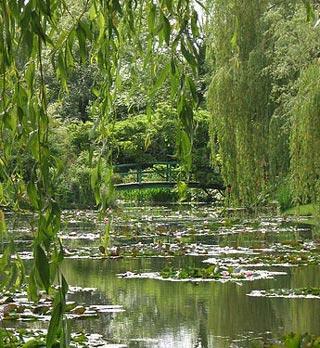 Giverny is situated in the Normandy countryside about half-way between Paris and Rouen. It is best known as being the place where the renowned impressionist painter Monet lived for 43 years until his death in 1926. During those years Monet forever immortalised the gardens in some of the most famous of his paintings, and the 'Monet gardens at Giverny' are now one of the most popular and most visited attractions in France. 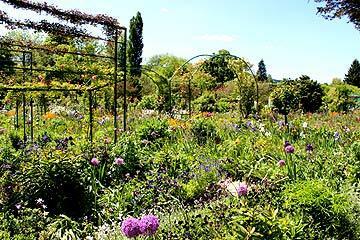 The gardens at Giverny are carefully preserved much as they were 100 years ago and it is impossible to visit without the gardens evoking the memory of the famous paintings. Because of this, the gardens attract both garden enthusiasts and also enthusiasts of the impressionist art movement. 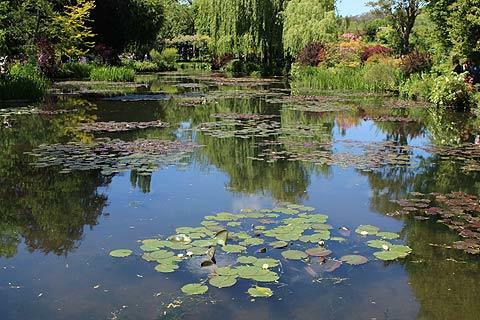 For enthusiasts of Monet a visit to the gardens at Giverny is as much a pilgrimage as a 'garden visit', giving an insight into the life and surroundings of Monet himself. Of course, first time visitors all want to see the waterlily pond and the bridge across the water, and the water gardens are still, for many, the highlight of a visit, but the rest of the gardens are also very lovely and of course meticulously maintained. Not surprising, since the gardens have more than 500 000 visitors a year paying around 10 euros each: I imagine 5 million euros a year pays for a lot of garden maintenance! There is something different to see each time and each season that you visit, from the tulips and daffodils of spring to the dahlias of early autumn, and much else in between... I was expecting the water lily pond to be the highlight but for me it was the borders in front of Monet's house that stole the show. 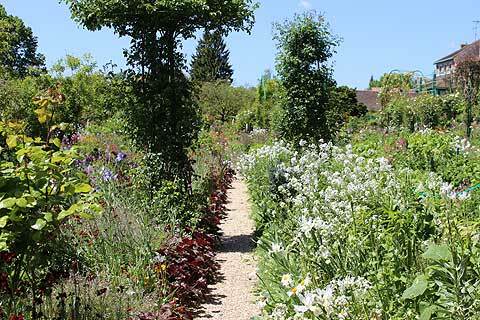 The borders were stunning and the beautiful medley of colours, especially blues, whites and pinks was incredible. Monet's house is also open to the public and you can see the lounge, kitchen and other rooms all beautifully furnished in 'country style'. The colourful decor inside the house wouldn't be out of place in a modern home even now 100 years later, and the rooms give the impression that Monet might just have stepped out for a while, perhaps to paint the garden, but could walk back in at any time. The house and gardens are open every day from the beginning of April to the end of October, basic admission price around ten euros. Aim to buy your tickets from the tourist office at Vernon to avoid long queues at Giverny. Important note: while the Monet gardens at Giverny are very lovely do remember there are other fine gardens to visit in France! 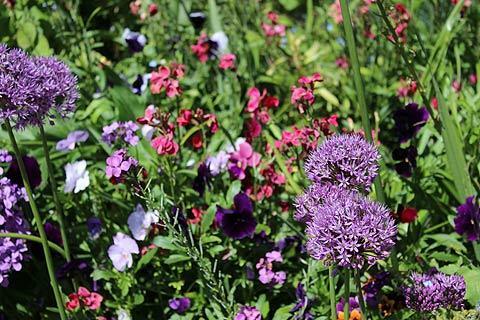 A photographer told us that there was no longer any demand for his photos of gardens in France unless they were of Giverny! 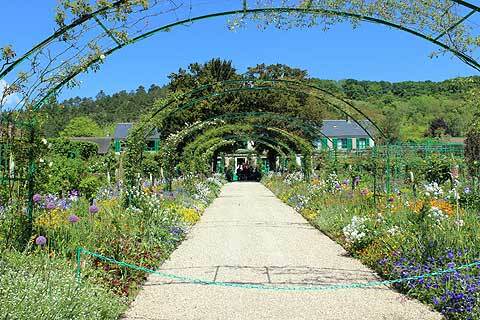 There are two related museums at Giverny - the Musée de Vernon and the Musee des Impressionismes Giverny. The Musee de Vernon is the only museum in the area where you can see a genuine Monet painting. 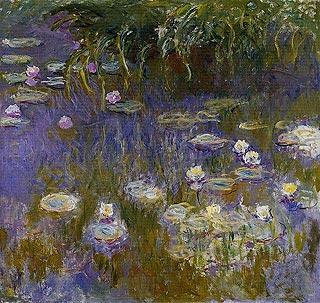 The museum has two paintings that were donated by Monet and his wife: Nymphaeas, a round painting of waterlilies, and also 'sunset at Pourville, painted on the Normandy coast. The museum also features paintings in a similar style by other local artists. Note: if you are in Paris you can see several of the Monet paintings of waterlilies in the Musée de l'Orangerie. The Musee des Impressionismes Giverny (Museim of Giverny Impressionists) has various exhibits explaining the lives and works of the impressionist painters. During the summer months exhibitions of works by other artists are often held at the museum. The museum is also surrounded by an attractive garden. 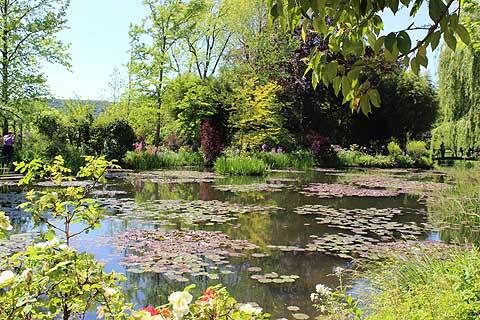 The attractive town of Vernon is just five kilometres from Giverny. It has some interesting sights, a museum with a couple of works by Monet and a tourist office where you can buy tickets for Giverny to avoid the queues at the gardens. The most beautiful village of La-Roche-Guyon is also close and worth a visit.